The innovative PL Medical retractable scalpel fits hands comfortably and is demanded in plastic and reconstructive surgery, neurosurgery, orthopedic surgery and oral surgery. This scalpel supports and enhances safe passing procedures and protocols already practiced within the Operating Rooms. This single-use scalpel is designed to provide utmost safety to health care providers from sharp edge related injuries. The scalpels are color-coded for ease of blade shape recognition. The scalpels feature a strong temporary forward lock position to prevent uncontrolled retraction when contacting with bone during use. The scalpel have a permanent lock for final disposal. 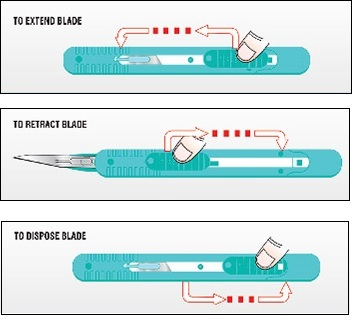 Our retractable disposable safety scalpel is easy-to-use with the following three steps: First, press down the lever and push forward to extend the blade out of the safety cartridge. The scalpel features a strong temporary forward lock position to prevent uncontrolled retraction when contacting with bone during use. After use, to retract the blade, press down the lever and pull backward. Finally, to dispose the device pull the lever completely back until you hear a ‘click.’ At that point the blade is fully retracted and is in the permanent lock position for final disposal. If you would like to purchase our disposable retractable scalpels please visit our online storefront on Amazon. If you are purchasing for a large organization please contact us directly for specialized pricing and delivery options. One-handed activation allowing the clinician to focus on the surgical site. The retractable design shields the blade, minimizing the risk of accidental cuts.